[Event Intro.] Lots of talent people in Star Academy, Academy will conduct exam in certain period to choose talent people. Dean announces that every week a round, each academy of students are eager to sign-up to show their best. Daily Contest will be conducted on every Monday to Friday, 6p.m. to 8p.m. at Sacred Heart City. Semi-Final Contest will be conducted on Saturday, 7 p.m. to 8p.m. at Sacred Heart City. The Final Contest will be on Saturday, 6p.m. to 8p.m. Lv character is 30 or above can join any Imperial Examination, team-up is not allowed during examination. Quiz Contest categorised into 3: Daily Contest, Contest Semi-Final, and Final Contest. Players have participated Daily and Semi-Final Contest with flying colour requires to join Final Contest. I. Examiner of Daily Contest will appear at the centre of Sacred Heart City, every Monday to Friday, 5p.m. to 12a.m. Players that above Lv 30 are allowed to participate. II. Answer quiz can get great Exp, Silver, and others. If answered correct, players can also get item reward. III. Answer correct in Daily Contest, will get 6 points, if get wrong, players only get 3 points. IV. The points that get from Daily Contest are important, it will affect the final result of Semi-Final. I. Examiner of Semi-Final Contest will appear at Sacred Heart City on every Saturday 3p.m. to 8p.m. Players who Lv 30 and above can go apply. II. After applied, players will go to find different examiner to answer questions. Each examiner will give 3 questions to players, and there are total 10 examiners with total 30 questions. III. Semi-Final Quiz Answer, players get 6 points when answer correct, and 3 points if wrong answer. The time that used to answer quiz will be bonus points and calculate in in the Semi-Final. IV. Final result of Semi-Final Contest will be ranked according to the points of Semi-Final and add-on the points of first 5 days Daily Contest. First 30% of players will be required to enter Final Contest. I. 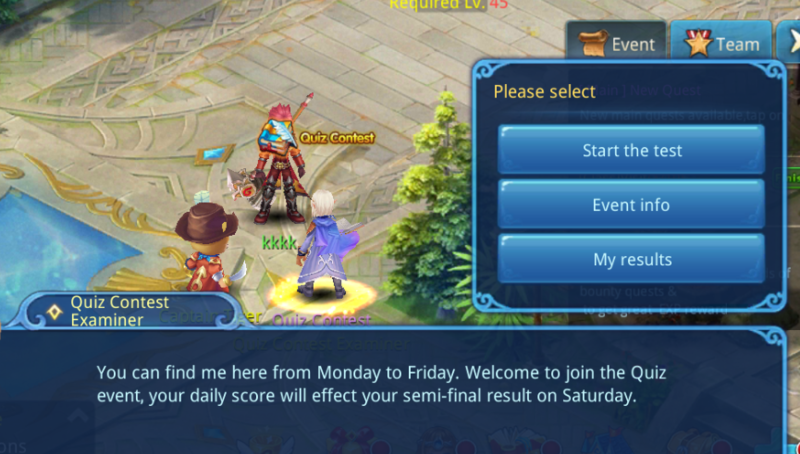 Those players that achieved the requirement within event time can go through the Daily Panel or shortcut to enter Final Field and search the examiner for answering quiz. II. Players have 20 seconds of time limit to answer question, took it as wrong answer if timeout. So, please alert on time using. III. Final result will be decided by the accuracy on answering. If the accuracies are the same, time using will be the next term to rank. IV. First 10th in the Final Contest, will receive super cool title and great rewards!